Having a blog allows me to share my thoughts, experiences, and opinions with the world. I have finally arrived at the point in my life where I will no longer hold back what I feel and experience out of fear that it might offend someone or make them uncomfortable. I am going to share what moves me, what inspires me, and what frustrates me. People don’t have to agree, like what I say, or give me a loud amen, but my hope is that people will listen and consider the ideas that I feel compelled and inspired to share here. Yesterday was Independence Day here in America. People in every city all over the United States were celebrating and honoring our Nation’s birthday in their preferred way, and our neighbors to the north just wrapped up their celebrations of Canada Day. We live just outside our Nation’s Capital, so you can imagine how extravagant and far reaching the festivities here can be. We had plans to get up-close and personal to the big display downtown, but decided at the last minute to stay home because a number of factors. Although it was relatively quiet all day in our neighborhood, there were some loud celebratory 4th of July explosions around our town when the sun went down. They lasted well into the night. Considering the disruptive and startling nature of fireworks, the animals in our home did really well. I spent most of the night helping them to feel safe and counterconditioning them to the Big Bad Booms. As things finally settled down in our town, we all settled in for the night. It was then that I became very frustrated and upset with something I saw unfolding on social media. 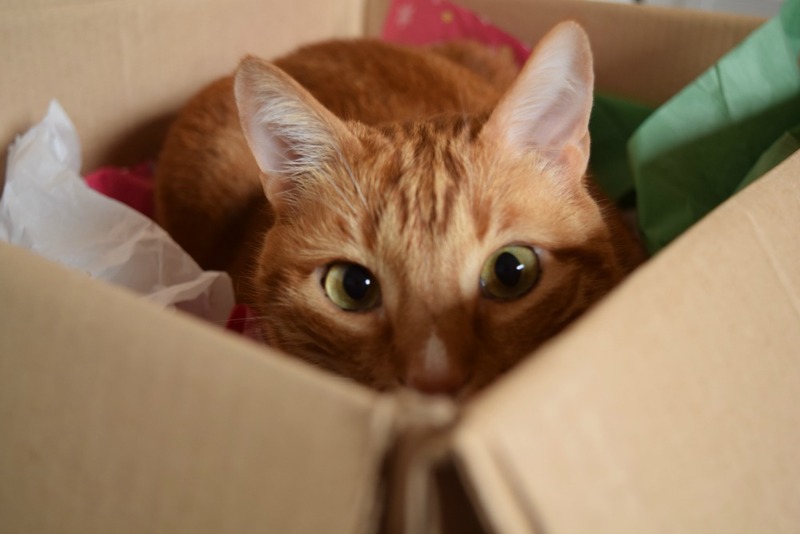 Countless strangers, friends, acquaintances, and various connections on social media sites shared pictures from all around the world of their cats, dogs, parrots, rabbits, ferrets, etc. being scared out of their minds because of the fireworks. I saw dogs shaking and trembling in bathtubs, cats crouching in terror under chairs, and parrots terrified in their cages. As I was sadden to see SO MANY ANIMALS IN SUCH PANIC AND TERROR, I was even more saddened to see people taking pictures of this and posting them! Let me be clear: These people weren’t asking for help or advice. They were making sarcastic comments about how their pet “wasn’t feeling patriotic” or that “he needs a drink”. Rather than helping their pets cope with the assault on their senses, they were sharing their pet’s misery with the world. Most would claim that these pet owners weren’t being cruel to their pets, and maybe they had other harmless intentions that I am unaware of, but what I saw begs this question: Would you take a picture of your grandmother or child while she was cowering in the corner, experiencing real terror and fear? Would you take a snapshot of your mother panicking and post in on social media? You wouldn’t. I wouldn’t. Who would? So why are we doing this to the animals we claim to love so much? I believe it’s because there is a disconnect – a missing link – between people and their animals. This disconnect is why people give up so easily on their pets. It’s why people find it easier to euthanize than understand, and then compromise with their pets. It’s why we see animal cruelty even in the most subtle forms all over the world. This disconnect is deeply damaging. How did we become so deeply disconnected from the animals we share our homes with? How is it 2015, and we still see a dog as just a dog, a cat as just a cat, and any other animal companion as just a pet? Where is our compassion, empathy, and understanding? Where is the meaningful, soulful connection? This post isn’t meant to berate, judge, or condemn people who are disconnected from their animal companions. I am asking tough questions and bringing up something that I hope people will consider and ask themselves. My goal is to encourage pet owners (and dog trainers, veterinary technicians, veterinarians, zoo keepers, aquarists, and other animal care professionals) to really take a hard and honest look at how they view, treat, and respond to the animals under their care. Although it deeply frustrates and saddens me, I can understand the disconnect, because I’ve lived it. Well over a decade ago I saw animals as something separate from me. I failed to recognize their universal connection to me that my Cherokee ancestors understood. As a child, religion taught me that humans are the superior species and that all animals were here for “human purposes”, but somehow, I think somewhere deep inside my heart, I knew this was not true. Now, from personal and professional experiences, I see their suffering, their joy, their depth, and who they really are. I see them as species living along side of us, in a world of their own; a world that is just as meaningful and dear to them as we view our world. Their lives are no less than ours. Their souls are as infinite as our own. Their lives are just as valuable. It took countless difficult (and beautiful) experiences for me to see all animals as our brothers and sisters in this world. This requires questioning what we have been taught. It requires looking deeply at our personal beliefs that have never been challenged. It also requires a great deal of inner reflection at who we are as a person. I learned that when we are open to, and compassionate about our own suffering in life, this allows us greater strength and courage to recognize the suffering of others, and to fully embrace it – instead of looking away or dismissing it with laughter and jokes. 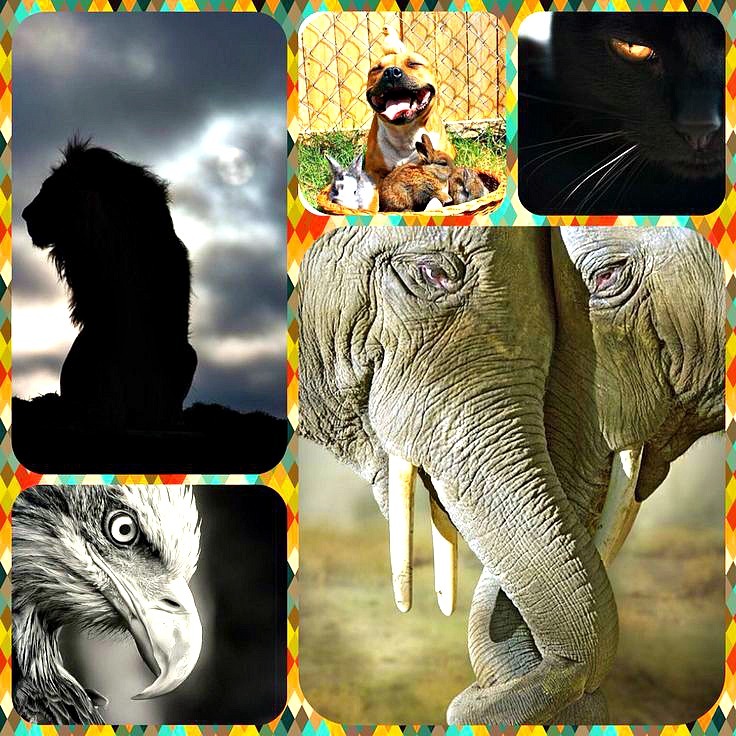 This includes the animals we are guardians of in our professional and personal lives. I would love to hear your thoughts and experiences on all of this. Have you felt a disconnect with an animal companion at some point in your life? What helped you to bridge that gap and connect more deeply? Are you still feeling disconnected? Are you willing to make a deeper connection? I ask because I really do understand this feeling and frustration. I have been there many times, over many years. I ask because I genuinely want to see people and animals form a lifelong, deeply enriching and life changing bond. It’s there. It’s available to all of us. We just have to open our hearts. On a side note, I would like to give a sincere shout-out to all of you who shared this post about food, stress, and fear on your personal Facebook feed last night. 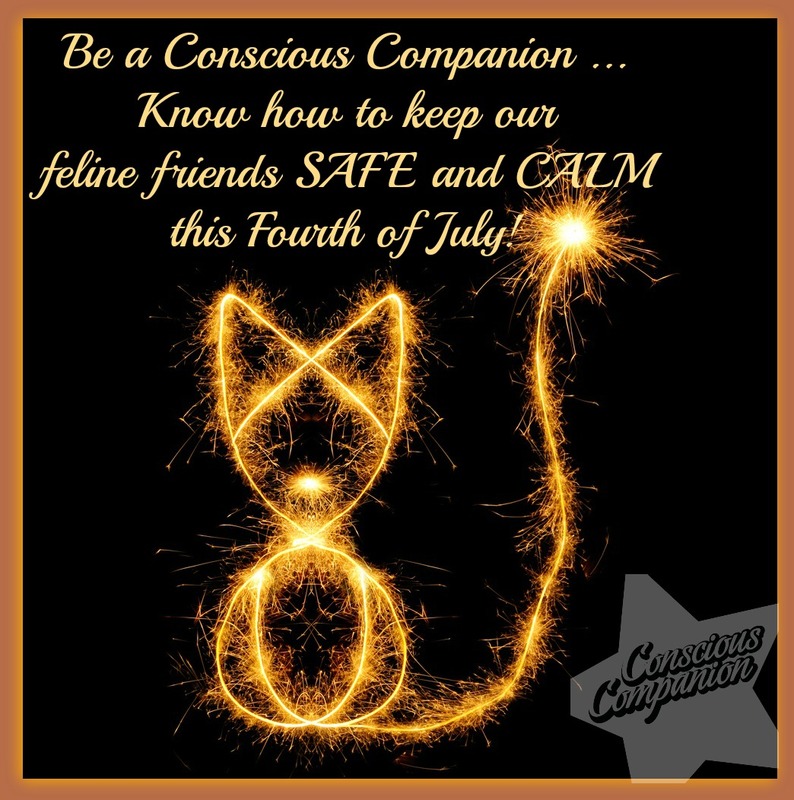 I had a feeling that you all were watching many similar posts about pets and fireworks. Thanks so much. You guys rock. I hope you were able to help other people and their pets. Because isn’t helping people – helping all living things – one of the best things in life? Provide Comfort When They Are Afraid. Have the Memorial Day weekend fireworks and celebrations started in your neighborhood yet? They started here several nights ago, and none of the animals were pleased, to say the least. As their guardian, it’s my job to take the time to help them cope with the onslaught of noise, and change they way they feel about those sounds. Unfortunately, a lot of people believe this common myth: Don’t comfort an animal when he/she is afraid; you’re only reinforcing their fears. Here’s my science-based response to that myth: Always Comfort the animal. You cannot reinforce Fear. Ignoring their fear and terror is borderline neglect. In this video you will learn (just the tip of the iceberg of) why we *should* be providing comfort when our pets are nervous or scared. You will learn why you *cannot* reinforce fear. Fear is an emotion, not a behavior. 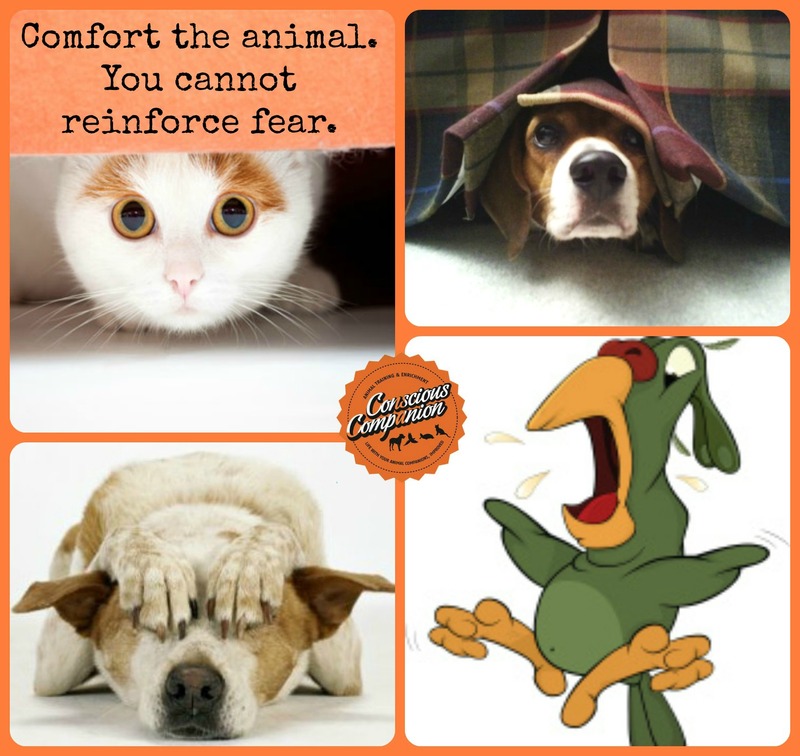 Comforting a fearful animal will not make the animal more afraid, and it will not “reinforce fear” (unless this is the only interaction the animal ever receives). 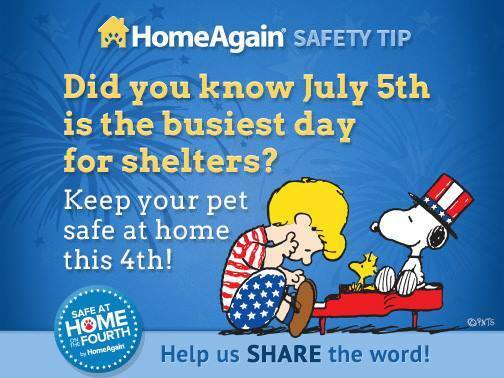 Petting, cuddling, or comforting an animal when they are afraid can help them — worse case, it may not do anything. However, comforting them will not reinforce their fear. Fact: Animals in a constant state of fear or stress are more susceptible to diseases, and their immune systems are not as effective (cited) . So when the pops, cracks, booms and bangs begin, and you see that the dog/cat/bird, etc. is clearly frightened, remember to remain calm and comfort them. You are their guardian and protector. You can help them. Providing comfort and a sense of safety is the sensible, loving thing to offer to anyone in need, especially our animal companions. Can you Reinforce Your Dog’s Fear? TRAINING TIP: A better approach than comforting alone, is investing some time on counterconditioning, a behavior modification technique meant to change the animal’s emotional response toward a feared stimulus by encouraging an emotion incompatible with fear. In Counterconditioning we use food to change the animal’s underlying emotional response to the perceived threat so that he/she learns that “scary things” are now good things. To “condition” means to teach, and to “counter” means to change. 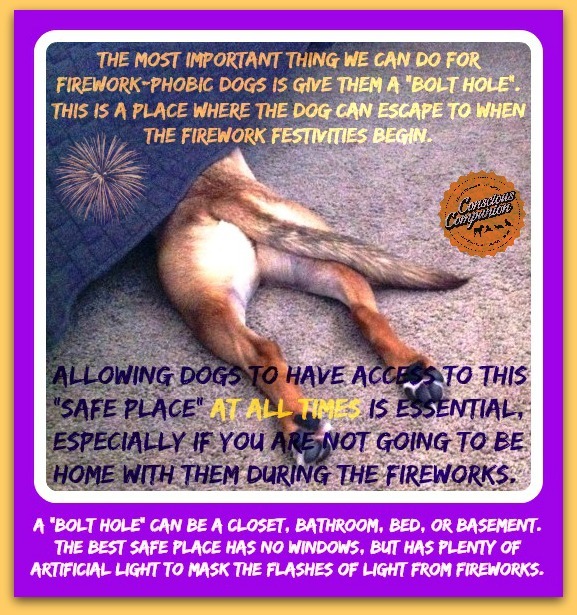 —> If you would like to learn how to do this, check out my tips on how to help your pets cope during fireworks, HERE! 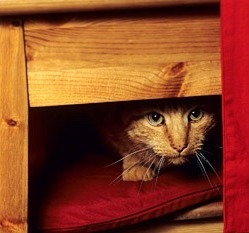 Do you have any tips for helping your animals when they are afraid? Please share below!